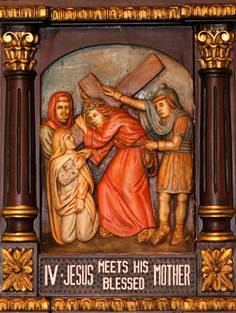 SThe Stations of the Cross (or the Via Crucis) are a part of the Catholic experience of Lent whereupon each Friday we as a community place ourselves in prayer along this way of sorrows, and reflect upon the Passion of our Lord. We are told that our practice of praying the Stations can be traced back to St. Francis of Assisi who lived at a time when Christian pilgrims to the Holy Land could not travel in safety, so Francis tried to bring the experience of the Holy Land home. As the Franciscans sent out missionaries, they took with them the practice of praying the stations and thus have the fourteen traditional stations become a universal part of our Catholic parishes. In Jerusalem, the actual Via Dolorosa wends its way from where the Praetorium once stood to where the Holy Sepulcher stands empty, and the Franciscan Friars oft times lead the pilgrims through the streets of Jerusalem marking the same fourteen stations we reflect upon here in Jasper. Our Stations of the Cross are prayed at 6 p.m. on the Fridays of Lent (Good Friday notwithstanding), and they are followed by a Lenten meal of fish or soup for a minimum cost. All are encouraged to come and stand beside the Virgin, and walk this familiar path of the Passion of our Lord.